Horses are large animals, but they have relatively delicate digestive systems. In their natural environment, horses survive by consuming large amounts of forage over the course of many hours. In their domesticated environment, they typically receive several highly concentrated meals a day plus a smaller, nutritionally rich amount of forage. Digestive problems can occur if a horse is fed the wrong amount or type of feed, or fed too soon after being worked. You do not want to feed your horse immediately before or immediately after he is ridden and worked. The more rigorous the exercise you have planned, the longer you should wait. 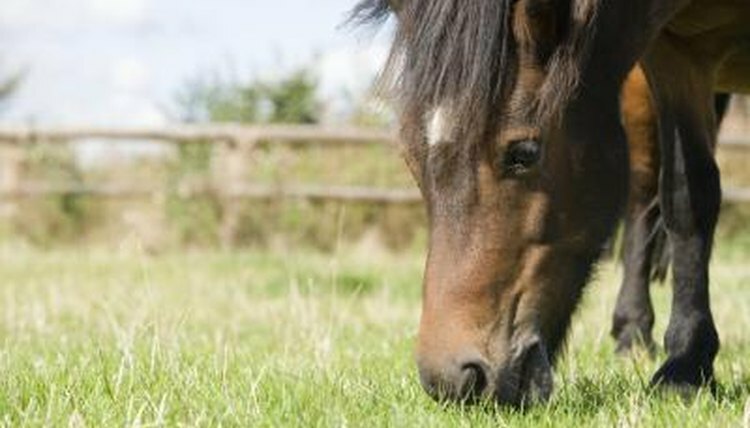 If your horse eats immediately before or immediately after exercise, his body may have difficulty digesting his food. Horses are unable to throw up; they lack the physical ability to regurgitate food, so they have no choice but to attempt to digest whatever they have in their stomachs. When a horse has difficulty digesting his food properly, and is unable to digest or pass food through his system, a condition called colic occurs. This condition can be fatal, so it is crucial to do everything you can to prevent your horse from colicking. Your horse's body diverts blood away from his digestive system when he is working, slowing his body's ability to digest the food. When the digestive system slows, your horse's chances of experiencing colic increase significantly. Furthermore, a full stomach limits the amount of room your horse's lungs have to work during exercise. Because the lungs have less room to work, the horse's body must work harder to perform the exercises you are asking him to perform. Long rides, or those that require the horse to perform at the highest level of his physical abilities, should be avoided right after your horse has finished a meal. If you are planning to ride your horse during the same time frame as his normal feeding time, the Humane Society of the United States recommends you make sure to wait at least an hour after he has eaten before you ride him. They also recommend waiting at least three hours after eating if you are planning on taking a strenuous ride. The Humane Society of the United States advises allowing your horse to cool down completely after a ride before you feed him. Your horse should not be breathing hard, he should have a normal heart rate and his skin should not be hot or sweaty when you touch him. If your horse does not seem calm, cool and completely physically comfortable after the ride, you should avoid feeding him.